This 2 CD set is a total winner. 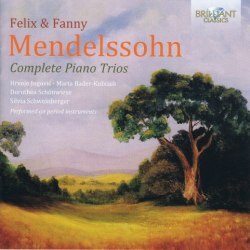 It presents the complete piano trios of Felix and Fanny Mendelssohn on period instruments, in spirited performances that deliver the music at its finest. The first numbered piano trio, in D minor, is a great leap forward, a masterpiece, and gets vibrantly played here. The same goes for the second trio - Felix and Fanny wrote all these pieces in minor keys - although in the second the opening movement (‘allegro energico e con fuoco’) is lacking in fuoco. This trio, one of Mendelssohn’s last works, may initially be harder to crack, but the performers really dig into the scherzo and finale, so best is emphatically saved for last.